But as big and bold as it sounds, its voice remains refined and lovely from the first note to the fading final moments of the resonant sustain. The second thing that comes to mind is how the guitar stands apart from others I am used to seeing and playing, and how its uniqueness makes it a good example for anyone contemplating a custom order from an independent, small-shop luthier. We are living in a golden age of luthiery, with many talented builders throughout the world and across America offering designs and techniques both traditional and progressive, to create exquisite musical instruments. While major manufacturers continue to dominate the market with their classic models, many players find appealing the notion of having one special guitar built just for them by one specific builder. After researching several small-shop builders and developing a good sense of what he wanted in a guitar, the owner of this guitar chose Kathy Wingert to create it. Once the decision was made, the client engaged in a dialog with Wingert through email, phone calls and ultimately a visit to her workshop while on a trip to California. Guided by the descriptions of what he most cherishes in a good guitar, she brought to bear her intuition, experience, and recommendations for realizing his list of must-haves, wished-fors, and dreamt-of-always-havings, and together they came up with a design representative of her luthiery and her client’s musical personality. His original intention was to have her build for him a 12-fret dreadnought similar to his favorite Martins. While she has made 12-fret guitars, and offers her own take on the 14-fret dreadnought design, this particular client changed his mind and decided to order one of Wingert’s own body shapes. It was agreed that the Model F would likely provide him with the sonic properties he found most appealing. He sought for warmth and a fuller tonal pallet, and therefore wanted some sort of rosewood for the back and sides. She said a soundboard of the Italian Alpine Spruce from her stacks would assure “incredibly rich bass and thick round trebles,” and she thought it would match well with a set she had in stock of the rosewood species native to Southeast Asia. He heartily agreed with this combination of tonewoods, feeling it appropriate and appealing, since he is of Italian descent and his wife is Vietnamese. Wingert already employs several Martin-esque aspects to her building, including the basic bracing configuration and a traditional, hand-fitted dovetail neck joint. But the player’s affinity for 12-fret dreadnoughts and his description of the sort of tone he desired gave her a ballpark target to aim for when it came to shaping the braces and voicing the top. And by gum! A 12-fret dread is exactly what the dynamics and string to string balance reminded me of, before I even heard the owner’s story about what they were shooting for when creating the guitar. The low E string seems plump when first struck, and each return to that lowest bass string proves it as succulent as ripe fruit ready to drop from the tree. Although there is extra umph swelling out from the bottom end, the mid-range strings are also fat, yet firm and focused. Instead of sagging into the most open part of the undertone between the bass and treble, they stay buoyant, as if rising over some invisible bridge leading toward the treble strings, which themselves are clear and nicely cut through an otherwise lush tonal pallet. So, rather than a mid-range trough, as often happens in large, 14-fret guitars, there is surprising balance across the strings, even as the low E string throbs out each time it is struck. And to my ear that is all reminiscent of the 12-fret dreadnought voice. Is this due to the luthier’s skill in achieving her client’s aural goal, or the fact Alpine Spruce tends to have brighter mids, which stand out between the warmer bookends around the bass and treble? Perhaps it is a combination of both, since she is accustomed to working with that particular spruce, knowing well its potential and how to tap the chisel at the right places to sculpt the sonic properties that best combine the top wood with the particular tonewood chosen for this specific instrument. Among the most impressive aspects of this guitar is how well it responds to high-tension fingerstyle playing. I took it through its paces, driving the top fully, and plucking and pulling on two strings at a time with my thumb and middle finger, releasing them with a snap at maximum string tension. As I played through a series of gliding double-stops in such a manner, I found the guitar managed pure fundamentals at all levels of attack. I love to play hard, dig in and throw my emotions into a guitar, and I could play this one with everything I had. But at either end of the dynamic range, the guitar retained the same sonic identity when I played it as lightly as I could muster. The notes stayed clear and pure, while the warm resonance they conjured up proved rich without encroaching upon that fundamental purity. It was as if I simply changed the volume dial, but it didn’t lose interest when caressed lightly, nor did it wig out with distortion if I overloaded the diaphragm of the soundboard. And I should add, this was all done on light gauge strings. Just as impressive for me, when playing softly, or applying fret board technique to produce unvoiced notes through trills, hammer-ons or vibrato, the faintest alteration in tone or timbre was defined and apparent, even as the final remnants of a sustained chord faded out of hearing. And when it came to all that work done to maximize resonance and dynamics, as lush and thick as the voice is, sustained chords allowed each fundamental and many sympathetics to stand out, always nicely defined as they rose and fell, like pools of colored light coming in and out on the darker background of that complex rosewood undertone. In plain terms, the lady knows her stuff. With quality tonewoods matched by the artistry used to create it, this custom Wingert Model F has a full-bodied voice rich and satisfying as steaming hot cocoa made with half and half, while allowing for clear notes that come right through all that indulgent rosewood/alpine spruce tone. The F size is rather feminine in shape with wide shoulders of the upper bout curving pertly into a tight waist, and then out around the expansive, circular shape of the bottom bout. While Wingert calls this size the Grand Auditorium, the guitar is closer to a Martin Jumbo than an M, each having the same size top, but the Jumbo, like this Model F, has a 4-7/8” dreadnought depth. Ebony is used for the fingerboard, body binding, and bridge, but the bridge is noticeably banded, so it may be made from the Macassar ebony native to Indonesia. The trim around the body is stark black with thin white lines, which tie in well with the black motif, allowing the very straight and quartersawn spruce and rosewood to stand out. And the K Wingert logo on the ebony headstock faceplate is rather dark and made from bluish-green abalone, often fading from view. But the thin geometric strips of abalone in the jet black sound hole rosette are from a brighter variety of pearl inlay, with some silver and pinks. The black of the rosette isn’t made of wood, but it remains unclear what it is. The owner says the design was something the luthier was inspired to come up with for this guitar. The fingerboard markers are abalone microdots of dark hues, but reflect light so they appear to someone across the room like stars against a clear, black sky. And the back strip is of very busy high-color abalone, made all the more lustrous by the chocolaty brown rosewood. On the whole, it is a very woody aesthetic and what non-wood elements are included were delegated as accents. 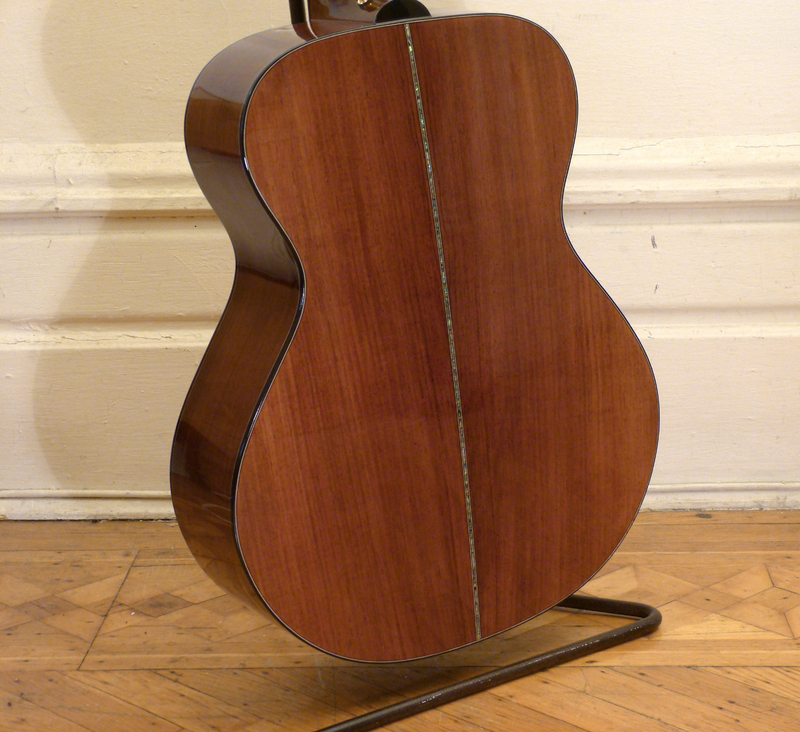 This is a large guitar, but the waist and lower bout allow one to use it for lap playing without feeling like they are playing a large guitar. The owner actually plays with the guitar on his left knee, in the classical style, further negating the wide lower bout or deeper side depth. The mahogany neck was shaped based upon the client’s preference for wide necks that were not too thick in terms of girth. The width measures 1-13/16” at the nut, splitting the difference between the 1-7/8” used on the old 12-fretters, and the 1-3/4” used on some of the client’s 14-fret dreadnoughts. It isn’t terribly shallow or flat, but the shaping is heading toward a true low profile. There is no discernible V, unless one runs their thumb sideways across the back of the neck, when a tiny crest can be perceived. One point of interest: Wingert encases her necks in rigid veneers for stability. She also inserts graphite supports as well as a dual action truss rod. It is safe to say this neck isn’t going anywhere any time soon. I enjoyed how the back of the neck grew more shallow down near the nut, but then sloped up to a sort of tongue beyond where the hand reaches while playing. This was due to the headstock being notably thinner than the neck, and the aesthetic of that abrupt toboggan curl is an attractive touch. 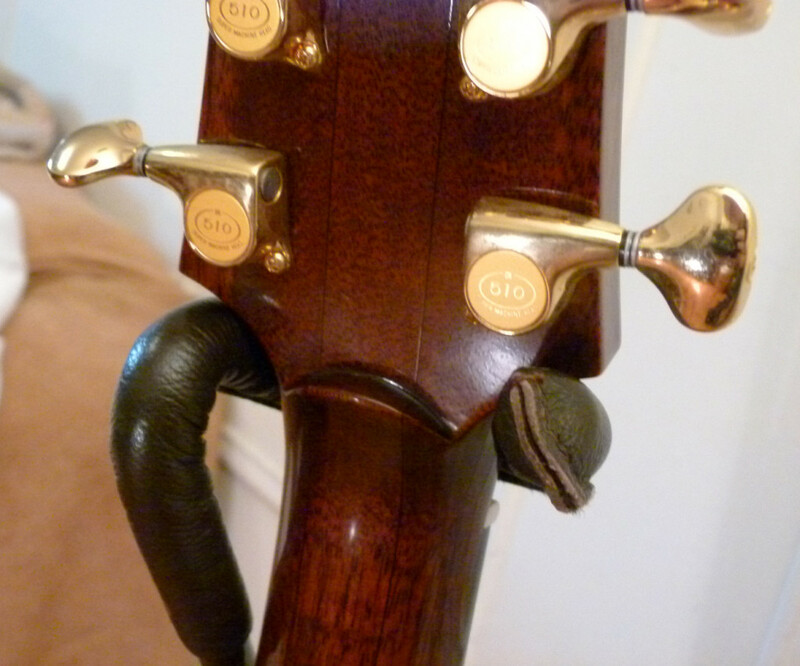 That is just one of many nice, little touches, as was the rather truncated neck heel, which allows easier access to the upper frets. Matched with 2-5/16” string spacing, the grasp does feel more like a 1-3/4” neck in the first position, due to the low-ish profile, but it begins to feel more like a 1-7/8” neck as the hand moves into uppermost frets. While my personal preference is for a narrower swath up near the body, the owner is quite happy with this neck, as it is less bulky than some of his older Martins. There is considerable appeal to having a custom guitar made by a luthier with a small, independent shop. And that is intensified when the combined inspiration of client and builder meld to envision and ultimately realize an instrument not quite like any other that came before it. On the whole, this Wingert Model F custom order is a unique piece of luthiery, having both conspicuously unusual and comfortably familiar aspects. 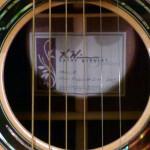 It is no wonder orders for Kathy Wingert’s guitars have grown right along with her reputation. If you own a Wingert guitar, we would love to hear your perspective. Please leave a comment below. 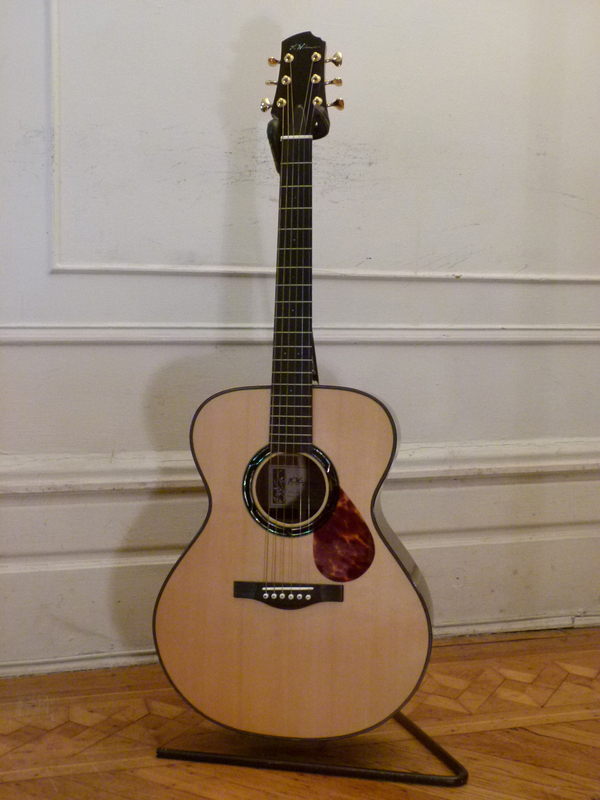 I have a Kathy Wingert E model that is quite simply the most beautiful guitar I’ve ever seen or heard. With cocobolo back and sides and an European spruce top, it’s a joy to play. The entire experience of working with Kathy, and with her daughter Jimmie on the inlay, was very rewarding. I was excited when a pic of my E was used in an Acoustic Guitar magazine article on ordering custom guitars. For anyone considering a custom instrument, you won’t go wrong with a Wingert! Onemanz, you may know I have a Wingert on order due in June! probably an F, fan fret, African blackwood, German spruce. I’ll send you photos and a short vid when it’s here, but these reviews really set my mind set my mind at ease that I’m getting a top shelf contemporary fingerstyle guitar. Thanks as always! I have 3 Wingerts (12-fret Model E, her 1st harp guitar, and a baritone) and I treasure each one. I love the fact that I can be subtle on these instruments when I wish as well as loud and brash when needed, where a lot of builders just go for loud. Regarding comments on the neck, as a custom builder, Kathy can naturally do pretty much whatever the player needs/wishes. Thank you for the comment, Frank. And welcome to One Man’s Guitar. That is quite a collection in just those three guitars! I agree, often is made a guitar that can either be played very hard, or responds well to the most delicate playing, but rarely are both achieved in the same instrument. And it is always telling when someone is happy to return to the same luthier for more than one guitar! Beautiful looking and sounding guitar from a true craftswoman. Wonderful! Welcome to One Man’s Guitar, Stephen, and thanks for the comment. This was our first experience with a Wingert up close and personal. And we look very forward to seeing others as time goes by.